Josh is being honored as a Star of Life for his continued commitment to public service, as well as his bravery and dedication as an EMT. Josh has the skills, mindset, and tenacity to handle emergency scenarios that require the ability to make quick decisions. His actions proved this when he assisted a fellow AMR ambulance crew after he noticed them stopped on the Interstate. The crew was on a 911 call with a distressed patient who became violent and combative in route to the hospital. Josh acted quickly to aid the crew and assisted in controlling the situation until police arrived. Josh’s actions helped to prevent any further injury to the crew and patient. Josh has been with AMR working within the DC 911 system since it began two years prior, joining to get more fast-paced emergency experience. 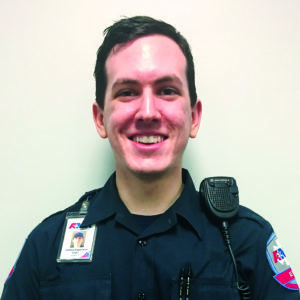 Josh is one who enjoys his work and continues every day to pursue his career in public safety.